A learning network is a facilitated, peer-to-peer learning approach that can be highly effective at documenting and sharing knowledge between donors and implementing partners to help strengthen a particular technical area. A learning network is one tool that can help support the implementation of USAID's collaborating, learning, and adapting (CLA) approach throughout the Program Cycle. Welcome to the Learning Networks Resource Center.. This Resource Center is a space for USAID and partner organizations interested in the learning network approach. While the information in the Center draws heavily from the experiences of the GROOVE Learning Network, it can be applied to any organization or donor interested in forming or learning more about USAID’s learning network approach. The Center is a companion resource to the "Practices of Successful Learning Networks" paper that further explains the learning network approach, provides reasons for utilizing learning networks, and discusses successful practices that emerged from the GROOVE Learning Network. The Resource Center is organized by the six primary phases of USAID-supported learning networks with characteristics, tools and resources, and "stories" from the GROOVE Learning Network. Learn more about how USAID defines learning networks and their primary characteristics. Explore current and past USAID-funded learning networks. Read about the GROOVE learning network’s core objectives and learning agenda. Find out key characteristics of each phase and view engaging stories from the GROOVE learning network. Explore this specially curated library dedicated to enhancing understanding of learning networks. Since 2001, USAID has supported a number of learning networks that brought together a variety of stakeholders to generate learning around specific technical topics. Learning networks can be a highly effective learning tool for network partners, donors, and the larger industry and can make a significant contribution to development impact. Why participate in or initiate a learning network? The regular interaction, shared learning agendas, and moments of discovery fostered by learning networks help create a culture of collaboration. Collaboration among organizations has a multiplier effect that can impact the larger industry. Participation within a learning network can also facilitate growth within an organization as best practices are shared and new learning emerges. Learning networks are one tool to support collaborating, learning, and adapting (CLA) and can help USAID and partners throughout the Program Cycle. Talking honestly about experiences and facilitating targeted peer-to-peer support helps to bridge geographical and operational gaps between implementing partners and donors. Learning networks can help bring to scale innovations within a larger industry through the development and piloting of new approaches that are then shared out by network members. What’s the difference between learning networks and other peer-to-peer learning structures? There are a number of peer-to-peer learning tools and approaches that can be effective for development impact, including learning networks, communities of practice (CoPs), and networks of practice (NoPs). However, CoPs and NoPs are often more informally structured with voluntary membership and less-defined deliverables or outputs required from group members. CoPs and NoPs often form organically, and membership is variable depending on the interest of potential members. They may be supported by a learning agenda and the use of facilitation, but are often more loosely defined and have fewer resources available. In contrast, USAID learning networks are more structured, smaller, output-oriented, and supported by additional resources. Network Design: The focus of the learning network is defined by the funding organization, a call for network partners is issued, and qualified partners are selected through a competitive grant process. Network Launch: Network partners come together to brainstorm organizational learning agendas and develop workplans. Organizational Learning: Network partners work on organizational learning agendas, engage in peer-to-peer learning, and receive regular technical support from other network members and industry experts. Broader Group Engagement: Engagement with network partners increases and a deeper network-level learning begins to develop. Network Learning: The group shifts from a singular focus on organizational learning to network learning and refines a network-level learning agenda. Industry Engagement: The learning network finalizes deliverables and shares out learning with the larger development community. Creates a platform for members of the learning network, and the organizations they represent, to explore their internal learning questions and connect this learning to the larger industry. USAID funded five partner organizations to examine the question: does a systematic, intentional and resourced approach to collaborating, learning, and adapting (CLA) contribute to improved organizational effectiveness and development outcomes? And if so, how and under what conditions? Each partner used their $100,000 grant to design and implement a study in response to these questions over 20 months ending in April 2018. See here for more on building the evidence base for CLA. USAID awarded the New Partners in Value Chain Development grant in June 2009 in an effort to support a growing cadre of non-governmental organization (NGO) and private voluntary organization (PVO) partners dedicated to improving their knowledge, skills, and abilities in the field of value chain development. The MicroRISK Alliance is a public-private partnership initiative that aimed to address risk mitigation and management issues for the microfinance industry. MicroRISK Alliance was an innovative partnership model that was designed to engage microfinance risk management practitioners in a collaborative learning process to document and share findings on the risks facing the microfinance industry and help identify effective and replicable risk management practices and innovations. The Poverty and Conflict Learning Network aimed to increase understanding of the potential or limits of interventions to promote poverty reduction and conflict mitigation, develop measures of poverty reduction impacts, and promote learning in evaluating and assessing poverty in conflict/fragile communities. The Practitioner Learning Program (PLP), funded by USAID through the FIELD-Support mechanism, focused on approaches to, and the interconnection of, rural and agricultural finance (RAF) and household well-being, including food security. The PLP's goal was to impact the financial options available to rural households and enterprises in order to better serve their needs and contribute to a vibrant rural economy, both on and off the farm. The ultimate objective was to improve the standard of living for rural households. The PLP, funded by USAID through the FIELD-Support mechanism, aimed to empower microfinance and enterprise development practitioners through peer learning to build and strengthen strategic alliances with partner organizations and to document and disseminate the most effective models for developing these alliances for maximizing impact. The PLP, funded by USAID through the FIELD-Support mechanism, was focused on empowering practitioners through peer learning to design and measure each element of their youth-serving workforce development programs. It intended to incorporate understanding of, and response to, market needs and opportunities, and to develop the range of skills that youth need in order to achieve more success more quickly in finding employment or starting and developing their own enterprises. The objective of this PLP was to identify, encourage, and disseminate replicable strategies for market-driven programs that improve youth employment success and measure the effectives of these strategies. This program encouraged learning, discussion, and publication on offering financial services to poor and other vulnerable populations. This program encouraged learning, discussion, and publication on issues in value chain development, including constraints, social and environmental objectives, and standards. This program aimed to better understand the linkage between microfinance and expanding access to energy services. This program explored and tested ways of using strategic alliances in rural areas to facilitate access to a range of financial and non-financial services and solutions. These solutions help microenterprises better integrate into growing markets, creating economic growth and wealth in poor, rural communities. This program examined the strategies, tools, and technologies that microfinance institutions (MFIs) can use to efficiently maximize existing human and physical resources, with a focus on low-technology solutions to increase staff productivity, decrease personnel or administrative costs, and increase outreach and client retention. Participants in this program field-tested poverty assessment tools that held promise for potential replication in diverse settings and institutions. These field tests complemented USAID’s Accelerated Microenterprise Advancement Project (AMAP) effort to test rigorous, practitioner-oriented client poverty assessment tools and criteria for certifying them. This program examined MFI strategies, tools, and technologies for becoming more client-focused and market-led when providing products and services and facilitating internal management operations. This program supported the innovative strategies and efforts of business development services (BDS) facilitators as they conducted and used market assessments to design targeted interventions that helped create wealth in poor communities and promoted economic growth by linking microenterprises to productive markets. The GROOVE Learning Network is one example of a USAID-funded learning network and is referenced frequently throughout this Resource Center. USAID awarded the New Partners in Value Chain Development (later re-named to the Growing Organizational Value Chain Excellence—GROOVE—Learning Network) grant in June 2009 in an effort to support a growing cadre of non-governmental organization (NGO) and private voluntary organization (PVO) partners dedicated to improving their knowledge, skills, and abilities in the field of value chain development in collaboration with USAID and other major donors. Through a competitive selection process, four grantee organizations (CARE, CHF International, Conservation International, and Practical Action) were selected on the strength of their proposals, specifically the unique perspectives they brought towards integrating the value chain development approach into their programming. The grant activities were implemented over a 3-year period, with grants managed by USAID’s Knowledge-Driven Microenterprise Development (KDMD) project in partnership with USAID’s microenterprise development team. • Demonstrate advantages of the value chain approach to achieve sustained economic benefits for poor households. • Identify and build champions within the NGO/PVO community to expand the application of and catalyze learning about the value chain approach and its potential benefits for poor households. • Foster partnerships with implementing partners that demonstrate the interest and capacity to learn from and contribute to the USAID microenterprise development team’s growing knowledge of and experience with value chain development. • Promote innovation, learning, and organizational change within partner institutions that are driven by a common vision for success, lessons learned in the field, and evidence-based decision-making. Conservation International (CI) set out to explore and expand knowledge around value chains with a common natural resources theme, and to broaden their employment of value chain development across multiple sectors and geographies. Throughout the duration of the GROOVE Learning Network, CI worked with partners in Madagascar and Liberia to include value chain approaches in “green economy” development, as well as in Cambodia by integrating an ecosystems approach with value chain development in aquaculture projects. By utilizing a value chain approach to payments for ecosystem services, CI has worked with partners to amplify the benefits to human well-being generated by healthy ecosystems. CARE launched a new Market Engagement Strategy in 2008 with a goal of helping ten million women and girls to escape poverty by 2015. Participation in the GROOVE Learning Network represented a central component of CARE's effort to achieve these goals by building staff capacity in value chain program design and monitoring and evaluation, with a specific focus on impact measurement. CARE worked to develop a universal monitoring and evaluation system to track progress across the organization's value chain projects; established an internal community of practice to enhance information flows and knowledge transfer (notably, informed by input from Practical Action’s GROOVE participation); and, in collaboration with MEDA, developed an online, publicly available e-learning course on market assessment and value chain program design. These tools serve as building blocks upon which CARE continues to expand as it seeks to improve the lives of women, girls, and the extreme poor by scaling value chain programming. Practical Action is building more effective and sustainable learning systems for sustainable impact at scale on the lives of marginalized producers and generating knowledge that is useful to other development agents such as donors, policy-makers, and other NGOs. Through the GROOVE Learning Network, Practical Action sought to facilitate processes to select and understand useful knowledge, produce robust evidence of impact, and expand the outreach and influence of this evidence and promising practices to achieve impact. Practical Action's strategy focused on three core solutions: capacity building, knowledge products, and Impact Awards. These core solutions were implemented by country and regional teams through the promotion of “local learning groups” to promote face-to-face, contextualized learning. Practical Action has also benefitted by participating in the GROOVE Learning Network’s mentoring program for value chain development practitioners and is incorporating lessons learned into the capacity building efforts around its Participatory Market System Development (PMSD) approach and PMSD Roadmap tool. The diverse range of activities and approaches implemented by the GROOVE organizations proved to be incredibly valuable for not only the individual organizations, but also for the broader network and their collaborative efforts. GROOVE members had common expertise and spoke the same “language” of value chain development, but the differences in their organizational approaches made them a valuable sounding board for one another and increased the significance of their contributions to the broader field of market systems development. Watch Nina Kolbe-Ullery of Conservation International and Lucho Osorio of Practical Action talk about their experience in USAID's Growing Value Chain Organizational Excellence (GROOVE) Learning Network. A learning network can be a highly effective learning tool for development donors and practitioners. Learning networks are part think tank, part training group, and part support network to the practitioners and organizations who take part in them. Donor-enabled, collaborative learning networks provide an unusual opportunity for donors to engage with a range of implementing partners around learning, knowledge production, and knowledge sharing. To determine whether a learning network is an appropriate tool for you, refer to the “About Learning Networks” section in this Center. Although there is no one correct way to design a learning network, there are a number of good learning network examples from which to draw experience and guidance. Below are some possible considerations to keep in mind, with illustrative examples from the GROOVE Learning Network that was managed by the Knowledge-Driven Microenterprise Development (KDMD) project. The KDMD project did an extensive review of past learning networks to develop the model that was eventually adopted for the GROOVE Learning Network. KDMD’s early learning network model was envisioned to have three main stages: Planning, Implementation/Generation, and Capture/Sharing. Demonstrate advantages of the value chain approach to achieve sustained economic benefits for poor households. Identify and build champions within the NGO/PVO community to expand the application of and catalyze learning about the value chain approach and its potential benefits for poor households. Foster partnerships with implementing partners that demonstrate the interest and capacity to learn from and contribute to USAID/MD’s growing knowledge of and experience with value chain development. Promote innovation, learning, and organizational change within partner institutions that are driven by a common vision for success, lessons learned in the field, and evidence-based decision-making. Past experience had shown that careful grantee selection was crucial to the network’s success. Grantees were carefully screened in regards to their anticipated commitment to participate in the learning network, as many interested applicants were direct competitors. Finally, while reviewing RFA applications, USAID/MD assessed the potential complementarity and synergy between grantees to create a network where sharing and learning was possible. In an effort to reduce the burden of application, the RFA allowed for submissions of Expressions of Interest (EOI) as opposed to a full proposal. Out of the numerous (almost 100) EOIs received, USAID/MD shortlisted only a few to which they provided feedback. Out of these shortlisted candidates, four were selected to receive funding. In addition to the items outlined above, the GROOVE Learning Network RFA also included specific requirements to encourage organizational investment and participation. As part of their EOI, organizations were required to specify two individuals who would be designated to consistently participate in the learning network to build trust and rapport between the members. Although many learning network activities were decided on by the members once the grant began, some activities were specifically outlined in the RFA. These included: 1) participation in three, in-person meetings (kick-off, mid-term, and final) throughout the course of the 3-year grant and 2) the generation of network knowledge products. Finally, the RFA required that interested organizations provided a minimum amount of cost share to contribute to USAID's investment and, perhaps more importantly, to encourage organizational buy-in and support. Selecting a facilitator for the learning network is a crucial part of the design and start-up process. A scope of work (SOW) for the facilitator should be drafted and should accurately reflect the responsibilities as well as the estimated amount of time required from the facilitator. KDMD found, through its experience with the microRisk Alliance (MRA) Learning Network, that it was more important for a facilitator to have knowledge of facilitation skills rather than the learning network’s technical focus. This allowed a facilitator to fully focus on facilitating the learning within the network and helped to clarify the role of the facilitator for participating members. Technical support to the GROOVE Learning Network was provided by network members as well as industry experts, who were brought in at designated times to speak on topics of interest to members. Separating out these two requirements can also speed up the search for a facilitator, since it can be difficult to find one person with both subject matter experience and facilitation skills. KDMD discovered, through its experience with the Poverty and Conflict, MRA, and GROOVE learning networks, that it is crucial to have donor involvement and buy-in from the beginning. Donor involvement can help ensure that a learning network meets expectations and that it is designed to deliver outputs that will add value to the technical sector and community. Having a donor representative who actively participates in the learning network from the beginning can help to keep members engaged, committed, and motivated. Throughout the GROOVE Learning Network, the USAID/MD office played an integral role in the design, launch, and implementation of the network. This type of involvement was somewhat unusual for USAID (and network members) and required discussions to clearly define expectations and boundaries between learning network members and USAID. Finding the balance between providing input and listening to members was an ongoing process throughout the learning network grant. However, by trusting the learning network process and the members, USAID/MD was able to find that balance and, as a result, capitalize on learning. Watch a video that was created by GROOVE members during the Kick-Off Workshop in Washington DC in 2009. Once grants are awarded to learning network members, activities can officially begin. Although there is not one official list of activities that must happen during this phase, scheduling certain activities and events can help to set the learning network up for success in later phases. During the launch phase, it is important to properly set the stage so that network members can begin to build relationships with one another and view themselves as part of a larger network of individuals working towards a common goal. In the beginning, time should be spent allowing network members to get to know one another, with a focus on sharing information about member programs and activities in relation to their learning network grant. An in-person kick-off meeting is a great way to bring all members together so that they can discuss desired outcomes from network participation and begin drafting a joint learning agenda and work plans for the first year. Since most network activities will be virtual over the next few years, having an in-person event in the beginning is important to building a strong foundation. Some examples of activities that can occur during this phase are outlined below with examples from the GROOVE Learning Network. Webinar: In addition to the benefit that webinars are generally easier to put together than an in-person meeting, a webinar can provide participants with basic familiarity with each members’ objectives and start to build rapport. Grants for the GROOVE Learning Network formally began on July 1, 2009. In late July, a webinar was held with all network members to provide an opportunity to share elements of each organization’s program, particularly their work with value chains and their expected outcomes from the learning network. To view the agenda, and other documents from the GROOVE kick-off meeting, visit the "Resources" section on the right side of this page. How often do we see ourselves engaging? How will we use technology to communicate? What is the role of the learning network facilitator and USAID? What are our expectations for our monthly meetings? How will we document learning and share out our learning to USAID and others in the network? What are the rules for sharing and disseminating information both within the network and externally? Peer Assists: A peer assist is a collective discussion among group members designed to promote knowledge sharing and participatory learning. During the GROOVE kick-off meeting, a peer assist was held for each partner to help identify issues and desired outcomes from the learning network by discussing 1) What three aspects of the project will be the most difficult to achieve? and 2) What three questions around these areas could be addressed with peers? While GROOVE members found the peer assist process to be very useful, suggestions for improvement included providing more time for preparation and incorporating the input of “experts” into the process. Will these questions help to advance my organization's learning? Do these questions match primary knowledge gaps in the industry? Are these questions realistic and attainable for this network to address? Workplanning: Learning networks should include formal workplans to help members operationalize their learning agenda. GROOVE members developed draft workplans (see an example of a work plan here) for their organizations prior to the kick-off meeting but were then expected to incorporate information from the meeting and finalize those plans two weeks after the meeting. Watch Scott Yetter and Eileen Hoffman (both of CHF International) talk about how learning from GROOVE influenced their organization in the video above. After the network launch phase, learning networks initially tend to focus on the interests of individual organizational members in the network. These interests can be different for each organization, but ultimately should tie back to the overarching objectives for the learning network. During this third phase, network activities primarily focus on supporting the projects being implemented by network members in their own organizations and usually include presentations on project progress, peer assists, and technical support from network members and industry experts. Learning journals (see more below) are one way to document the experiences of network members and can be a valuable resource from which to pull issues and questions for discussion with the entire group. This phase provides important opportunities to build trust within the group which becomes increasingly important over the life of the learning network. To foster this trust, network activities should encourage collaboration, sharing, and engagement to ensure collective awareness of the interests, expertise, and progress of each member. This phase should also build upon the “Network Launch” activities to continue the development of a shared group learning agenda as members begin to better understand each other’s organizational contexts, common issues, and industry gaps. There is a wide variety of activities that can be undertaken during this phase. Listed below are some possible activities with examples from the GROOVE Learning Network. Regular Meetings: In the early months following the GROOVE kick-off meeting, regularly scheduled online meetings provided the opportunity for network members to connect. During these meetings—often held online through Adobe Connect—members shared relevant activities and communicated important updates for the learning network. During each meeting, network members shared out any program activities that had been implemented since the last meeting. Over time, these report-outs evolved into more structured sessions that focused on sharing progress, successes, challenges, and lessons learned. These more structured sessions helped network members better understand the progress and issues of each organization over time related to their goals of their grant. Technical Support: Regular infusion of technical knowledge is a core feature of learning networks. This knowledge can be generated either within the network itself or from outside the network, such as individual experts and outside organizations. Within the network, knowledge can be generated through polling, member presentations, and formal peer assists. GROOVE members were regularly polled during monthly meetings to identify areas of interest. In many cases, these topics would include questions about other network members’ models and approaches. Member presentations often facilitated important discussions that enabled network members to observe similarities in experiences and challenges among their varied projects. In addition, GROOVE members participated in a number of formalized peer assists to gather feedback on specific issues or questions throughout the life of the network. Outside of the network, learning network members can tap many valuable sources of industry expertise that can shed light on their specific learning topics as well as offer guidance and skills useful to all members. In one case, staff from Save the Children talked with GROOVE members about a Bolivia case study that outlined changes in strategy and activities as their work moved from a traditional delivery of services model to a value chain facilitation approach. Other sessions focused on practical guidance for webinar production and a short overview of SDC Asia’s experience building capacity for project staff and local partners. The GROOVE Learning Network also developed an “Ask the Expert” (later changed to “Ask the Colleague”) activity to answer technical questions posed by network members. Questions were generated by network members and then discussed with leading experts in the industry. In one Ask the Expert session, GROOVE members talked with experts about the United Nations model for communities of practice. In another, they discussed market facilitation with a leading expert in the field. Learning Journals: This self-directed activity provides an opportunity for members to reflect on their work, learn about others’ experiences, and raise questions for discussion. They are also a valuable tool for facilitators, who can highlight common themes or emerging synergies to stimulate conversation among the group. GROOVE members decided to draft and share quarterly learning journals. Generally speaking, they were seen as a useful tool and a powerful record of the steps, ongoing challenges, and interim intentions of each of the network members. USAID activity managers were also given the opportunity to read the journals and suggest topics for further discussion. Learn about how Practical Action and CARE began to collaborate more during this phase in the GROOVE Learning Network by watching Lucho Osorio (Practical Action) in the video above. As network members continue to implement their own projects, supported by the learning network grant, new learning often surfaces that other network members find relevant to their work. Through regular check-in meetings, offline discussions, and ongoing network activities, this knowledge can be shared and discussed within the group. In this way, other members often identify effective and replicable models or approaches to apply to their own work. Familiarity with the work of other network members, combined with depth of engagement early in the learning network’s life cycle, is essential to allow honest conversations to occur during this phase. These conversations might include suggestions for different approaches to existing issues or new interventions to try. Generally speaking, interaction among network members during this phase becomes broader, both in terms of the ways that members interact and in the ways that they contribute to the projects of other members. Recognizing and taking specific steps to accommodate this transition can help lay the foundation for further collaboration during the next phase. Activities from previous phases (e.g., regular meetings, peer assists, technical support) should continue during this phase. However, these activities often begin to evolve as the ties within the network strengthen. Below are some possible activities that can occur in this phase, with examples from the GROOVE Learning Network. Offline Peer Support: As the learning network regularizes its engagement, members may feel the need to communicate more frequently outside regular check-in meetings. Based on lessons learned from GROOVE, these member-to-member email exchanges and phone calls were not only valuable to those engaged, but also to the group as whole, since these exchanges were often integrated into regular group meetings. An important element of this phase is the opportunity for network members to test possibilities and identify places to borrow new ideas and approaches. For example, during this phase in the GROOVE Learning Network, CARE shared its draft monitoring and evaluation (M&E) guide with other members in the network for feedback. This action proved to be significant in the development of the network-wide learning agenda as members continued to focus on common interests related to M&E. GROOVE engaged in significantly more offline interactions with one another as the learning network moved into the second and third quarters of 2010. These were reported in their quarterly learning journals and semi-annual workplans. Conversations between members varied, including discussions about how to gain senior leadership buy-in, learning more about causal analysis methods, and brainstorming local learning exchanges. Facilitation Support: As collaboration within the GROOVE network intensified, the role of the facilitator shifted from a supporter to a connector. Through a combination of activities, including the learning journals, brown-bags, peer assists, and other activities, the facilitator often initiated discussions focused on the commonalities between the members and encouraged increased collaboration. By nurturing the growth of network relationships and facilitating collaboration between members, the learning network effectively operated at the individual member-level and, perhaps more importantly, began to lay the foundation for increased network-level learning during the next phase. Building Trust: In order to fully participate in a learning network, members need to feel that they have something to gain by contributing to and learning from other members. They also need to have clear expectations and a common understanding about how the knowledge they share will be used, especially in relation to their own organizational guidelines for information sharing. Trust between network members is essential for learning, and organizational buy-in is crucial to enable this trust to develop. If members feel that their organizations are uncomfortable sharing certain types of information with the learning network, there may be a hesitation to fully engage that could, in turn, hinder group collaboration and learning. Establishing organizational trust can be as simple as generating a memo or some type of informal recognition from the learning network donor expressing appreciation for their participation. However, sometimes members may need to undertake more formal processes to gain organizational buy-in. In the case of GROOVE, many member organizations directly competed with one another for value chain project contracts. Therefore, a more formal agreement was needed to clearly outline how information shared within the network would be used and how each member organization would be recognized in collaborative learning products. As a result, the members developed and signed a memorandum of understanding (MOU) that set clear expectations and guidelines for learning network collaboration. Mid-Term Workshop: It is often beneficial to bring learning network members together in person about halfway through the grant. This allows members to re-establish important bonds face-to-face and provides a dedicated block of time to focus on key learning network activities. The GROOVE mid-term workshop was held on November 4-5, 2010 in Washington, DC and was the first face-to-face meeting since the kick-off meeting 15 months earlier. Members came to the meeting eager to share ideas and engage with other GROOVE members. Several learning network members brought additional staff, which resulted in a highly energetic meeting with a great deal of dialogue around individual organizations’ experiences and network learning. This mid-term workshop provided an important opportunity to test the readiness of the group to address network-level learning and deliverables. Since the GROOVE kick-off meeting, relatively little attention had been paid to the network-level learning framework and agenda. This transition towards more focused network-level learning was jarring for some GROOVE members at first, but conversations become more organic and free-flowing as the workshop progressed (see agenda). In the end, original meeting objectives were still met and the group made considerable progress on their learning agenda and the learning network framework. In addition, learning network “product champions” were identified and commitments were made for more in-depth planning. Watch Christian Penotti (CARE) and Eileen Hoffman (CHF International) describe their experiences “turning the corner” to network learning in the GROOVE Learning Network in the videos above. While earlier phases primarily focus on building trust within the network, about midway through their life cycle, learning networks tend to “turn the corner” toward concentrated development of joint learning. The knowledge products that emerge from this learning (e.g., technical papers, guidance documents, tools) are collaboratively developed with input, ownership, and buy-in from all learning network members. The point at which learning networks are “ready” to address joint learning will vary between networks and will be unique to the members and structure of each. The learning network facilitator can play a key role in identifying opportunities for network-level learning and in easing the transition. For the GROOVE Learning Network, this happened gradually. The mid-term workshop in Phase 4 provided the opportunity to test the group’s readiness to focus more directly on network learning, but the members decided that an additional, informal meeting would help further solidify the collaboration and commitment between members. This period often involves a greater investment of time and energy from network members as individual, organizational work continues in conjunction with a greater emphasis on network-level deliverables. Typically, an increased level of engagement will be required among network members as they support one another around network-level initiatives. Listed below are some examples of activities that can occur in this phase with examples from the GROOVE Learning Network. Prioritization: During this phase, learning networks often experience a bit of a “reality check” where members become fully aware of the requirements and timeline (as outlined in each member grant) to produce network-level knowledge products. Although bringing network members together to accomplish these activities can be challenging, it can also be extremely productive and powerful as the network recognizes its full potential. In the months following the GROOVE mid-term workshop, network members continued to work hard to pursue their individual organizational learning agendas while also framing the work that would be done at the network level. For some, transitioning from organization-based learning to network-based learning was easy. For others, finding the additional time and resources to allocate towards network learning was a challenge. Securing the support of management early-on can help learning network members devote the time required not only for this crucial period, but throughout the life of the network. During this time, network members also faced a number of implementation challenges, some unrelated to the learning network (for example, organizational restructuring) while others indirectly resulted from GROOVE (for example, introducing learning into established organizational cultures). Being a part of the learning network helped members to deal with these challenges primarily through the support that was provided by other members experiencing similar circumstances. Network-Level Working Groups: As network members begin to concentrate more on the development of network-level knowledge products, it can be helpful to establish informal working groups for each product. This can help to focus members’ attention towards a specific deliverable and often increases efficiency with the establishment of clear deadlines and roles/responsibilities. After the mid-term workshop, GROOVE members formed working groups to pursue the two network learning agenda themes that were identified in the early stages of the learning network: monitoring and evaluation (M&E) and capacity building/mentoring at the local level. The capacity building working group decided to base their knowledge products on a curriculum that had been initially conceptualized by CARE and began to make plans to hold a workshop in Rwanda to pilot part of the capacity building/mentoring knowledge product. In conjunction with the mentoring workshop, network members leveraged the in-person opportunity to convene a learning meeting which focused on more detailed knowledge product planning and building on the members’ excitement and sense of accomplishment..
Support for Knowledge Product Development: It is important for members to recognize and plan for the necessary time and resources required to generate knowledge products towards the end of a learning network. While this should be discussed early in the life of a learning network, it should periodically be revisited to assess whether needs and requirements have shifted. While the USAID Knowledge-Driven Microenterprise Development (KDMD) project had been providing support to the GROOVE Learning Network since its inception, GROOVE members requested to expand KDMD’s role to include additional support for developing network knowledge products. As a result, a dedicated project staff member regularly assisted with network facilitation and activity coordination as well as the development of the network-level learning products. Scopes of work for learning network facilitators should also be revisited at designated times so that adjustments can be made to ensure that the network receives the support it needs during different phases. During this phase, the role of the GROOVE Learning Network facilitator was redefined to meet the shifting needs of the network. It was ultimately decided to have two network co-facilitators moving forward to share responsibilities. If this occurs, it is important to clearly define the roles of each facilitator. For GROOVE, one facilitator focused on moving forward the network-level learning agenda and providing technical support, while the other facilitator helped to coordinate member learning activities and ensure that sufficient support was available for the development of network-level knowledge products. 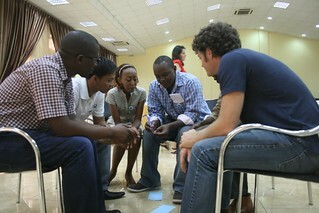 GROOVE members tested out the mentoring training during a workshop held in Kigali, Rwanda in July 2011. During the 4.5-day workshop, approximately 25 mentors and mentees from the four GROOVE member organizations converged to build a knowledge base on mentoring related to value chains, agree on roles and responsibilities, and finalize mentoring agreements. Directly after the workshop, the GROOVE Learning Network decided to capitalize on the gathering of members to hold another in-person meeting. The 3-day meeting had the advantage of directly building on the strong sense of group accomplishment and excitement that had resulted from the mentoring workshop. GROOVE members also focused on developing and fully building out detailed workplans for both of the network-level knowledge products on capacity building and M&E. Though conversations built on the experience of the working groups over the preceding months, the in-person meeting allowed for a level of exploration and detailed planning that had not been possible previously due to competing member obligations. In addition, the group began to conceptualize a third knowledge product that could be used by others who wanted to design or participate in a learning network. This Resource Center and the "Eight Practices of Successful Learning Networks" companion document are direct results of this brainstorming session. The Kigali workshop and in-person meeting were key turning points for GROOVE. Members not only jointly planned and collaboratively carried out a highly successful workshop based on their shared knowledge product on mentoring, but also took full responsibility for the development of the other network knowledge products.Finally, the Kigali workshop was an opportunity to fully appreciate the interaction between USAID (the donor) and GROOVE. In the months leading up to the workshop, a new USAID activity manager took over the role of managing GROOVE. This new activity manager attended the Kigali workshop and worked collaboratively with network members to test materials, answer questions, and work towards common network goals. Watch Lucho Osorio (Practical Action) talk about collaboration between the GROOVE Learning Network and MaFI in the video above. By this phase, most learning networks have already made significant connections with others in their industry as they pursue their own organizational and network-level learning agendas. Participating in conferences and events, soliciting technical assistance, and reaching out to others for feedback on network deliverables are all ways to build linkages with the industry throughout the course of the network. However, the focus in this last phase should move beyond previous forms of engagement towards a more structured dissemination of the learning network knowledge to the broader industry in an effort to influence practices and behavior for better project design, implementation, and, ultimately, impact. During this phase, learning network members will likely be working on a number of concurrent activities including completing their own organizational objectives, finalizing network-level knowledge products, and strategizing on how to share out network learning to the broader industry. As the learning network comes to an end, the question of “what’s next?” often arises. Below are some possible activities that can occur in this phase with examples from the GROOVE Learning Network. Finalizing Deliverables: Finalizing knowledge products is typically one of the most important activities that occur in the final phase of a learning network. The purpose of the knowledge products is to codify network-level learning and package it in such a way that it can be easily shared out with the larger industry. At the end of Phase 4, GROOVE members formed two working groups to focus on the production of their network-level knowledge products (capacity development/mentoring and M&E for value chains). In addition to these two groups, another group focused on the third informal learning product on learning networks. From the mid-term workshop through the end of the learning network, members frequently communicated to share drafts of knowledge products and to seek input based on the workplan that was refined during the Kigali meeting. The capacity development/mentoring knowledge product working group refined materials that could be used by other organizations implementing their own value chain programs. Final knowledge products included a program brochure, 10 training modules, and an administrator’s guide. This group also developed a marketing plan which analyzed possible users, established key messages, and set up an action plan. In addition to these knowledge products, the working group continued to provide ongoing support to the mentors and mentees who had participated in the Kigali workshop and incorporated feedback received during this time into the knowledge products. The M&E working group drafted two briefs based on key topics that had been identified by an industry knowledge gap analysis: Tacit Knowledge in Value Chain Monitoring: Good Practice Principles and Areas of Learning for the Future and Five Things that Every Practitioner Should Know about M&E for Value Chain Projects. These briefs were shared with others outside of the GROOVE Learning Network for comment and feedback utilizing a number of successful outreach strategies. One particularly effective review strategy was the identification of an advisory board made up of outside industry experts. In addition, the Market-Led Facilitation Initiative (MaFI) partnered with the GROOVE Learning Network to host an e-Consultation on one of the briefs through the Microlinks platform. This e-Consultation generated useful feedback that was then integrated into the brief. After considerable review, interaction, and redrafting, two final knowledge products were completed. During this period, input was also sought on a third informal knowledge product through online conversations. The working group decided to look specifically at factors for learning network success as well as the organizational culture of GROOVE. 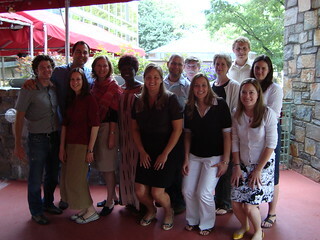 Final Meeting: The GROOVE Learning Network held its final in-person meeting in Washington, DC on June 25-26, 2012. Prior to the meeting, GROOVE members were polled on how they preferred to use the time and the agenda was developed to reflect feedback received. The final meeting was used as a time to celebrate GROOVE’s accomplishments and reflect on the impact that the learning network had on members and their organizations. During the meeting, members also discussed the question, “What’s next for the GROOVE Learning Network?” Key moments of the meeting were captured and the audio and video recordings were used in the production of this Resource Center. Industry Outreach: A major goal of learning networks is to capture and scale learning from the organizational level to the industry level. Dissemination of knowledge products to the larger industry is a key final network activity. From the beginning of the learning network, GROOVE members worked closely with a number of other organizations in the industry, including The Small Enterprise Education and Promotion Network (SEEP) and one of SEEP’s working groups, MaFI. This engagement provided significant opportunities for collaboration (including valuable feedback for knowledge products) and for building economies of scale. GROOVE members have continued to share their learning with the broader industry by sharing knowledge products on key industry websites and communicating key messages within their respective organizations. Have you led or participated in a learning network? Share your experiences and resources with the community.